Tracy Kraft-Tharp » The Budget Has Been Passed! The Budget Has Been Passed! On last Friday, April 5th the House successfully passed a balanced budget for the 2019-20 fiscal year after a late debate on Thursday night. 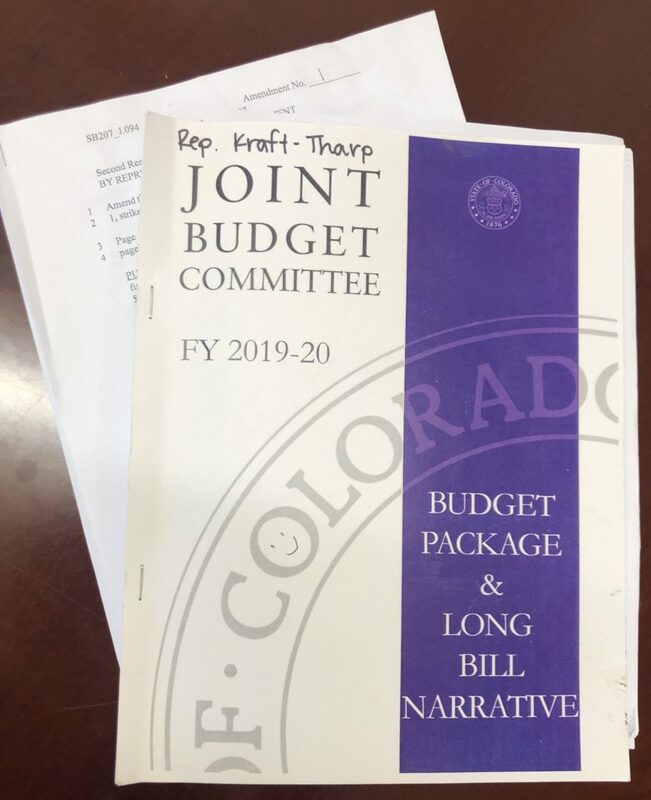 The Joint Budget Committee has worked hard over the past year to develop a budget that not only honors commitments made, but takes important steps forward for Colorado’s future. Increased investment in K-12 education of $335.9 million in funding for the implementation of full-day kindergarten as well as a $77 million boost in the budget stabilization factor buy-down. An additional $120 million investment in higher education to keep tuition flat for Colorado’s college students. Adds $1 million to help expand critical family planning services. Funds an additional $5 million for 42 new inpatient psychiatric beds at Colorado Mental Health Institute at Pueblo (CMHIP). Increases broadband deployment grants by $18.7 million. A $15.4 million placeholder for competency restoration (covers the state’s cost to reduce wait times for court-ordered mental-health evaluations). Adds $142,792 for management and maintenance costs for the new Veterans One-Stop (OneSource) Center in Grand Junction. The goal of the center is to improve services for Western Slope veterans by creating a hub for veterans’ organizations in the region. The facility will bring together, under one roof, multiple regional organizations that serve veterans’ needs.